Monday, May 7, 2018 ~ 11:30 a.m.
Sunday, May 6, 2018 ~ 4:00 – 6:00 p.m.
Vernelle E. Haertel, 95, of Waverly, NE, entered into rest on Thursday, May 3, 2018 at The Monarch in Lincoln, NE. 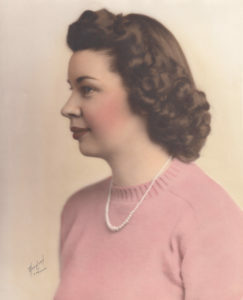 She was born May 20, 1922 in Cook, NE to Walter H. and Rosa Maria (Kienker) Damme. Vernelle graduated from Cook High School and then went on to Peru College for teacher training. She taught a rural school in Nemaha County and soon was able to teach in town schools in Cook, Elk Creek and Alvo, NE. On July 14, 1946, Vernelle was united in marriage to Leroy Haertel. After her teaching career, raising her three children and being a farmer’s wife kept her happy. Vernelle was a member of Word of Hope Lutheran Church in Ashland and American Legion #129 Auxiliary. She was a Sunday school teacher and the Sunday School Superintendent at American Lutheran Church. Vernelle enjoyed cooking and gardening. She is survived by children, Jerry (Patti) Haertel of Lincoln, Kent (Mary) Haertel of Greenwood and Patty Scheel of Waverly; grandchildren, Jennifer (Braj) Pandey, Garrett (Meaghan) Haertel, Paige (Chris) Dahlbeck, Chris (Lyndee) Haertel, Lisa (Dustin) Effle and Chad (Rachel) Scheel; great-grandchildren, Sophia and Lilia Pandey, Donnbhain, Reilly and Alannah Haertel, Ayzlee, Kade, Cohen and Caige Haertel, Jameson, Beck and Cora Effle and Knox Scheel; sisters, Beverly Schroeder of Syracuse and Jacki Hubbs of Fort Smith, AR. She was preceded in death by husband, Leroy Haertel; great-granddaughter, Emma Haertel; parents, Walter and Rosa Maria Damme; brother, Kenneth Damme. Patty, so sorry to hear about your Mother. Please express my best to your brothers and Chad and Lisa. I’ll always remember how Kansas nd and friendly your mom was. I hope you understand why I wouldn’t feel comfortable attending the services but I did want to express my sympathies to your family.